This is the first part of our year-end “Why We’re Thankful” series, highlighting the Bicycle Coalition’s—and your—accomplishments of 2014. 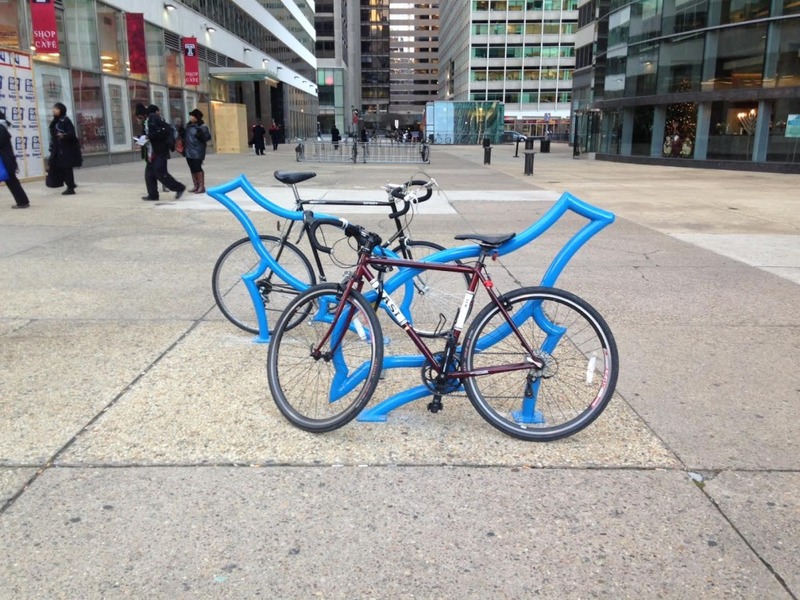 In 2013, the Bicycle Coalition of Greater Philadelphia, in conjunction with the City of Philadelphia Office of Arts, Culture and the Creative Economy put out a call for new bicycle racks—made by (some of) you, Philadelphia artists. The Bicycle Coalition and the people of Philadelphia couldn’t have made this accomplishment happen—or any of our accomplishments, for that matter—without your help. We need your participation to continue our work in 2015 and beyond. So, if you’re not yet, consider becoming a member of the Bicycle Coalition by clicking the button below. I’ve commented on this before but seeing these artistic and cute but totally useless bike racks drives me crazy! Have you seen the Philadelphia Stolen Bikes page of Facebook?! There is a very serious epidemic of theft out there that is impacting your core constituency and all you are offering in response in cuteness? How about a contest to come up with a SECURE bike rack? How about a working with the PPD on a bait bike program? How about developing a network of bike parking areas that are well-lit and have video surveillance 24/7? I know this has a “PR” benefit, but the worst kind of security is a FALSE sense of security and I think that these bike racks are actually making things worse! Michael – I agree with you to some degree, but I don’t see the design flaw in the birds. In fact, the only lock up that looks theoretically insecure is that spiral. Obviously, it depends on the materials used and how well its anchored, but I’d feel safe locking my bike to the birds. Something I’ve wondered looking at some of the designs is whether they’re safe in a general sense. In other words, has an engineer or risk assessment person looked over these designs to be sure they don’t create hazzards for people passing by – like sharp edges and trip hazards. Where I completely disagree with you is the reduction of the bike racks to PR value only. In fact, I think its a mistake to look at this purely through the lens of bike advocacy. People benefit from public art, but public art projects often get the axe when times are tight – and times always seem to be tight. With more bike commuters than any other big American city, Philly NEEDS more bike racks. 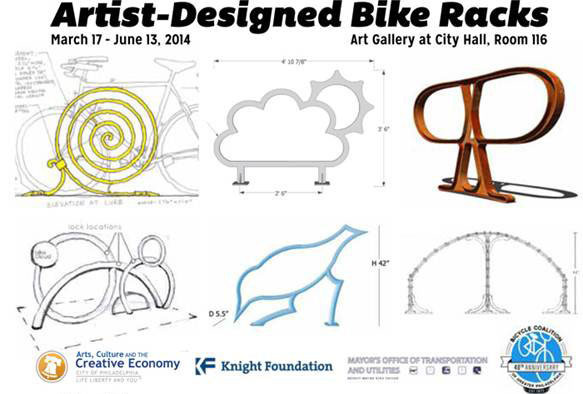 That need creates an opportunity for more public art. The ultimate good in this case isn’t PR for bikes. The ultimate good is for people, cyclist or not, that get to enjoy seeing more beautiful things in their everyday life.